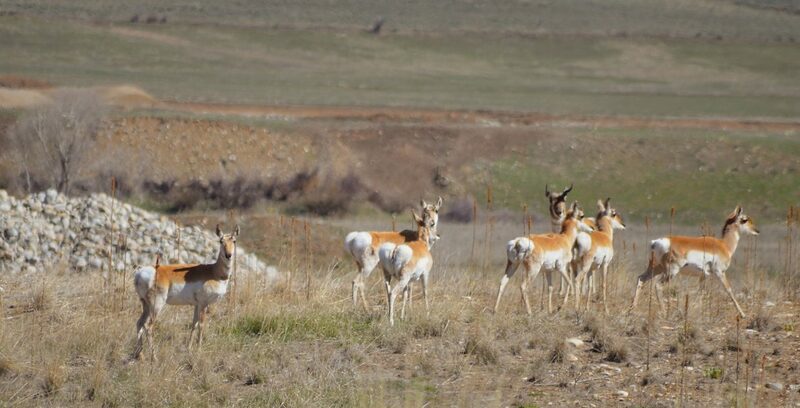 A small herd of pronghorn make their way across the Shorefox property earlier this spring. Granby Town officials and employees have been busy for the past several weeks preparing the property to open to the public. Granby will hold an open house for Shorefox from noon to 4 p.m. on Friday July 15, 2016. The long dormant Shorefox property north of Granby will soon begin seeing significant public use as the Town of Granby prepares to open select portions of the property beginning this week. Granby Town officials, including Granby Mayor Paul Chavoustie, will be conducting an “open house” at the Shorefox property from noon to 4 p.m. Friday, July 15. The open house will provide an opportunity for community members to come out and peruse portions of the property, review the Town’s overarching vision for the development and receive instruction on rules and regulations that apply to the 1,553-acre parcel. Not all of the Shorefox property will be open to the public initially. The lower sections of the property, those closest to US Highway 40 and US Highway 34, will be open to the public. This section includes the property’s previously developed and since abandoned golf course, two ponds that have been stocked with fish and approximately one mile of trails, primarily in the form of golf cart paths. The trail network on the property is being called Granby Trails. The upper sections of the property including those sections adjacent the Colorado River, will not be open this summer. There are still several active leases for river rights and cattle grazing on specific portions of the property’s northern section. The northern sections of the property also contain construction hazards such as manholes and vaults that could pose a danger to citizens wandering through those areas. Citizens caught trespassing in the northern sections of the property, which remain closed to the public, can expect to receive a fine. Officers from the Granby Police Dept. will begin patrolling the area as part of their standard operations. Chavoustie said the northern sections of the property will become open to the public in the future. Because of the truncated construction season in the Granby area Chavoustie said the northern sections of the property might not open for public use until summer 2018, depending on multiple different factors. Dogs are allowed on the property but there is a leash law, which town officials say will be strictly enforced. “Because of the sensitive nature of the wildlife in the area we cannot allow dogs to be loose running on the trails,” said Chavoustie. The Shorefox area is home to large amounts of pronghorn and is also utilized by moose, elk and deer. Town officials plan to develop a designated dog park on the property sometime in the future. Fishing will be allowed on the property’s ponds though anglers must have a valid Colorado State fishing license. The Town requests anyone fishing on the property engage in catch-and-release fishing, though regulations allow a maximum of two fish per person as a bag limit. Once the property opens this Friday the sections of the development that will be open to the public will remain open daily, from 7 a.m. to dusk, throughout the summer and early fall. Chavoustie said the Town will close the property for the coming winter, likely sometime in October. Town officials plan to keep the property open in future winters though, once additional amenities have been added. The Town of Granby purchased the Shorefox property earlier this year, entering into a formal purchase agreement in April. In June Granby closed on the property, which carried at $4.38 million price tag. Town officials plan to recoup Town funds used to purchase the property through use fees for specific amenities and through the sale of certain sections of the property to developers. Development parcels will be sold to create RV parks, campground areas and similar amenities. Developers will compete for the right to purchase development parcels and operate businesses within the larger Shorefox property through a “Request For Proposal” process very similar to the bid process used by the Town for selecting construction firms for municipal projects. If you would like to find out more about the property, or to leave a suggestion or comment for Town officials, you can check out the web site Granby created for the project at http://www.granbytrails.com.